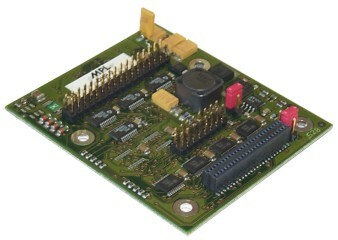 The DLP (Display Link Parallel) is a low cost interface for short distance panel adaptation to the MPL AG single board computers (SBC). The panel can be connected directly with his parallel TTL-interface to the DLP. Depending of several setting possibilities the DLP can be used with STN, D-STN and TFT panels with TTL-interface. The DLP module fits directly to the REMMI Connector on MPLs PIPx, MIPx and IPMx product lines. This solution can not be used with the PIP10 and PIP20 platforms. 6.89" x 5.73" x 0.98"
The DLP interface is directly connected to the parallel TTL interface of the panel. Therefore, no receiver is required which helps to keep down the costs.